Halloween is a scary (and fun) time of year! You will no doubt want your whole to join in on all of the festivities, including your pet! But it is important to keep them safe! Forgo the dangers and stress of Halloween by taking some common sense precautions to keep Fido happy and healthy all season long. The most important rule about human food and your pets, keep the trick or treat bowl away! Several popular Halloween treats are toxic to your pets. All forms of chocolate, especially baking or dark chocolate, can be dangerous for cats and dogs. Symptoms of chocolate poisoning may include vomiting, diarrhea, rapid breathing, increased heart rate, and seizures. Halloween candies or sugarfree candy containing the artificial sweetener xylitol is also something to watch out for if you have a dog. Even small amounts of xylitol can cause a sudden drop in blood sugar, loss of coordination, and seizures. Keep pet-safe treats on hand to satisfy your curious pet. Make sure all candies are out of your pet’s reach. Consider leaving your pet in another part of the house where exposure to hazards is impossible. If you suspect your pet has ingested something toxic, please call your veterinarian or the ASPCA Poison Control Center at (888) 426-4435 immediately. Everyone loves to decorate for Halloween, but take into consideration what you are putting on display and where you are placing it. Easy to reach decorations or candles, can be eaten or knocked over. If you have an especially curious pet, they are at risk of getting burned or singed by a candle flame. Although they are non-toxic, some Halloween plants, such as pumpkins and decorative corn, can induce gastrointestinal upset if ingested in large quantities. If large pieces are swallowed, an intestinal blockage can occur. And speaking of pumpkins, keep lit pumpkins away from your pet, Should they get too close, they run the risk of burning themselves, or knocking it over and causing a fire. 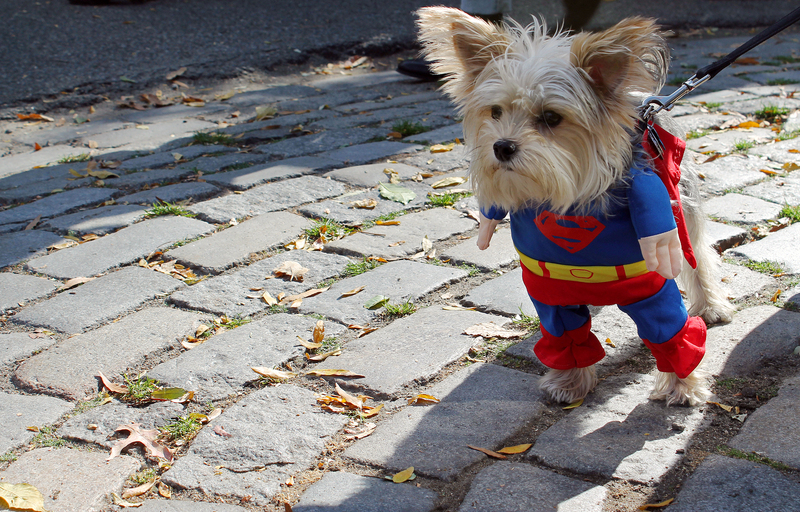 For some pets, wearing costumes causes unnecessary stress. It is important to not put a costume on your pet unless you know they love it. Be sure to have your pet try on the costume before the big night. Make sure the costume does not limit their movement, sight, or ability to breathe, bark or meow. Check the costume for small, dangling pieces that can be easily chewed off and present a choking hazard. If your pet seems distressed, allergic, or shows abnormal behavior, don’t force them to wear the costume. Instead, a festive bandana or collar or simply letting them strut around in their “birthday suit” is enough. Halloween brings a flurry of strangers to your door. Not only will your door be constantly opening and closing, but strangers will be dressed in unusual costumes and yelling loudly for candy.Dogs and cats can become skittish and anxiety-ridden on Halloween due to the incessant ringing of the doorbell, constant squeals and chatter just outside the door, and small fireworks set off in the street. Dogs are especially territorial and may be anxious or growl at trick or treaters. All but the most social pets should be kept in a separate room away from the front door. Putting your cat or dog in a separate room also prevents them from daring outside and getting lost into the night. Halloween isn’t an ideal time to let your dog or cat wander outside unattended. If your pet should escape and become lost, proper identification will increase the chances that they will be returned. A collar with ID tags and/or a microchip can be a lifesaver for a lost pet as long as the information is up to date. If you haven’t already opted to have your pet microchipped, now is a great time. Should your pet become lost, an ID tag and/or a microchip can help quickly reunite you with your dog or cat. Plastic pet IDs from Suds N Hugs are an easy, fun, and affordable way to identify your dog and ensure their safe return in case they wander away. With unlimited colors and design options, you can customize your plastic ID tag to fit your dog’s unique personality. October 4, 2017 in Dog Care, Holidays.